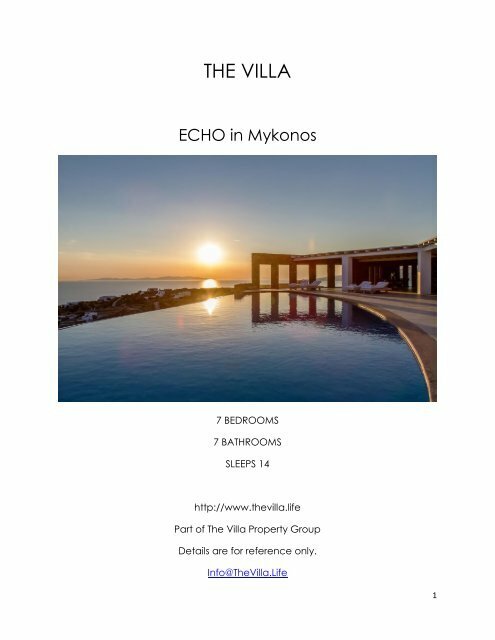 The luxurious Echo villa, just outside Mykonos, was created to capture the most amazing sunsets over the Aegean Sea. The semi-circular terrace is your front row seat to the most breathtaking show on the Island. With six elegant bedrooms, all with ensuite bathrooms and ocean views, Echo is perfect for an unforgettable Greek vacation with family and friends. Cycladic architecture mixed with sleek modern design creates a traditional, yet luxurious, atmosphere inside Echo. White stone, wooden roofs, and an open-air environment are staples of the Greek style, as is the appreciation of the wondrous natural surroundings. You’ll find evidence of this throughout Echo’s entire property. The bright living room opens to the terrace on two of its walls, allowing seamless flow of guests and ocean breeze. The formal dining room, with seating for twelve, adds a sophisticated minimalism to the villa with its designer furnishings and carefully selected decor. The fully equipped kitchen is finished almost completely in clean white, with high end appliances and plenty of workspace. With so much functional free-flowing indoor/outdoor space, Echo is perfect for hosting an upscale dinner soiree. After dinner, let the party spill out on to the terrace, or, maybe that’s where you should have dinner in the first place. With Alfresco dining, a generous amount of comfortable seating, sound system, and a wood fire barbecue, the terrace is a fully capable place for hosting as well. For a refreshing afternoon, take a dip in the salt water infinity pool, and after, air dry under the glowing sun in one of Echo’s many lounge chairs. When it’s time to get out and do some exploring, make the beautifully scenic coastal drive to Mykonos, you’ll notice a few great public beaches on the way. Rich with ancient historic sights, museums, architecture, boutique shops, and the finest dining, Mykonos is a town that has changed very little over the years, yet still remains one of the trendiest places on the planet.